This recipe must be made in stages, over at least 2 days. Although it’s a bit of a production, it’s actually quite simple. And if you like, since you are preserving the duck with salt and duck fat, you can store it in a jar for a couple of weeks before completing the final stage. The trickiest part may be finding the rendered duck fat that you will need for the first cooking stage. In France this is an easy matter — simply visit your poultry merchant and ask him for a pot of graisse de canard. 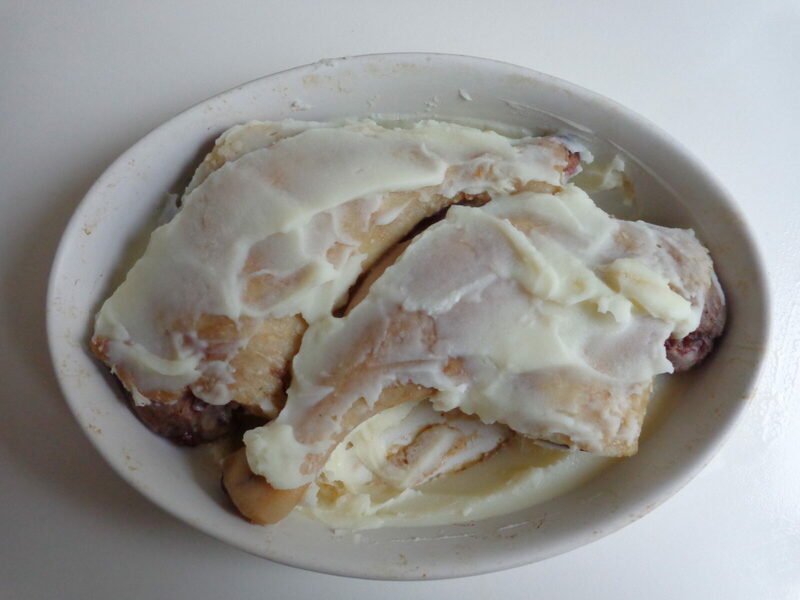 Elsewhere, rendered duck fat may be ordered online from various sources. Or, if you’d like to make some yourself, simply cook a duck and strain the melted fat as described below. This dish makes a spectacular winter meal. In France it is often served with pommes de terre sarladaises, potatoes cooked with chopped garlic in rendered duck fat and sprinkled with parsley before serving. It also marries well with rosemary potatoes, or a gratin — of potatoes, pumpkin or zucchini — or a vegetable purée, for example purée of celeriac, carrots or pumpkin. Another option is to serve the duck warm over a bed of tender salad leaves seasoned with balsamic vinaigrette. This recipe is adapted from Cuisine de France by Paul Bocuse (Flammarion, 1992). 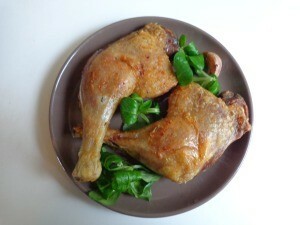 The day before you plan to cook the duck, place the legs in a bowl and cover them with the coarse salt. Refrigerate for 24 hours. The next day, thoroughly rinse the salt off the duck under cold running water. Place on a rack to drain and pat dry with paper towels. In a large, heavy-bottomed pot or skillet, heat the duck fat, garlic, thyme, bay and water to a high simmer. Place the duck legs in the hot fat, skin side down. Turn down the heat — the fat should remain at a very low simmer throughout the cooking process. Check the duck occasionally to make sure the fat is simmering but not boiling. After an hour, turn the legs over so that they are skin side up, being very careful not to pierce the skin. Allow to cook at a low simmer for one hour more. Turn off the heat and remove the legs to a rack to drain. Strain the fat through a sieve into a bowl. Place the browned bits and garlic that remain in the sieve in a separate small bowl. Discard the thyme and bay leaf. When the duck has cooled, place it in a dish, cover with the strained duck fat and refrigerate. When the fat has cooled sufficiently, use a knife or spatula to spread it over the duck. You may continue with the recipe later in the day, or leave the duck in the fridge for a day until ready to complete the cooking process. About 40 minutes before serving, preheat the oven to gas mark 7 (425 F, 220 C). Allow to preheat for 10 minutes. 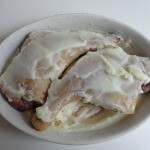 Remove the duck from its dish or jar, scraping away most of the fat, and place in a baking dish, skin side down. Roast the duck in the hot oven for 15 minutes. Turn the legs over so that they are skin side up. Continue roasting for another 15 minutes, or until the skin is a crispy brown. Serve immediately, accompanied with seasonal vegetables and a hearty red wine. Serves 2. You may use the garlic cloves that you’ve set aside as garnish. The brown bits left over from cooking — known as ‘grattons’ in French — may be spread on toast and served during cocktail hour. This sounds delicious. If I make this to store in a jar, does the jar need to be processed? Refrigerated or kept in a dark place. This would make a great gift for my fellow Francophile. Merci.